Have you ever wanted to make your very own cider and perry? Do you have a fruit tree that produces large amounts of excess fruit that goes to waste? We can contract press it for you! Enjoying a drink made out of your own fruit is one of natures many pleasures. 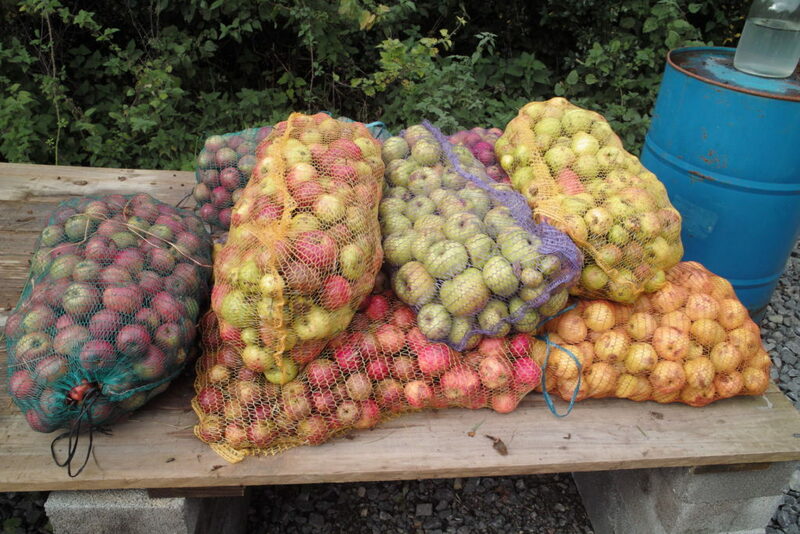 At Llanblethian Orchards we offer a contract pressing service for local people wanting to turn their excess fruit into cider. During the cider making season (late September to November) our press is running nearly every day. During that time we are happy to press other peoples apples by prior arrangement. 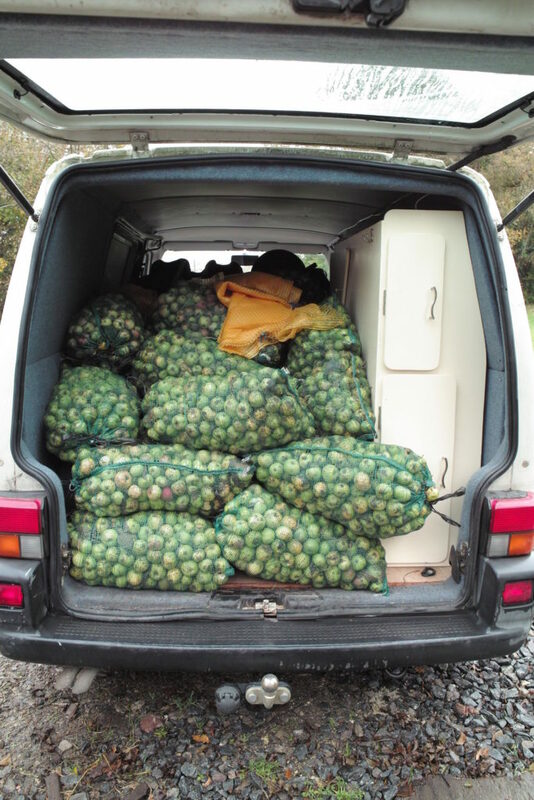 The minimum quantity our press can deal with is around 2-3 sacks of apples. Arrange a day and time with us in advance. Bring the fruit down together with the CLEAN vessels you want the finished juice put in and with your help we’ll wash the fruit, mill and press it for you. You can then take away your containers of juice and ferment it into cider! We charge 50p a gallon resultant juice on whatever is pressed. A token fee in truth just to cover the wear and tear of the equipment. As apples are around 85% juice and our press is 65-75% efficient we’d expect to get 60L (13 gallons) ish from 100kg fruit. The yield does depend heavily on the variety and season however. The cider mill all set up and ready to squish apples! Will my fruit make good cider? Who can say? It’s dependent on the whims of the apple and fermentation gods and your own definition of good! Generally a cider made out of eating and cooking apples alone will be too sharp if served dry. Getting hold of bittersweet cider apples in the blend would help immensely. Some hedgerow cider makers also add crab apples to the mix to add some bitterness. If the juice is suspected to be very sharp it could be fermented with a yeast that eats malic acid (the acid present in apples). An example of which is Lalvin 71b-1122 which I can sell if needed. During the summer months lactic acid bacteria could start ‘fermenting’ the cider converting malic acid to lactic acid reducing the acidity making it more paletable. This kind of cider would be in the Suffolk / Kent style. Light, fruity and very pleasant. Sugar also counters acidity so if a cider is too sharp dissolving a teaspoon of sugar in the glass before drinking can help immensely. The old boys used to have a lemonade top to their ciders if they’d ‘gone hard’ and were unpaletable! You’ll need clean fermentation vessels with air locks to ferment your juice into cider. 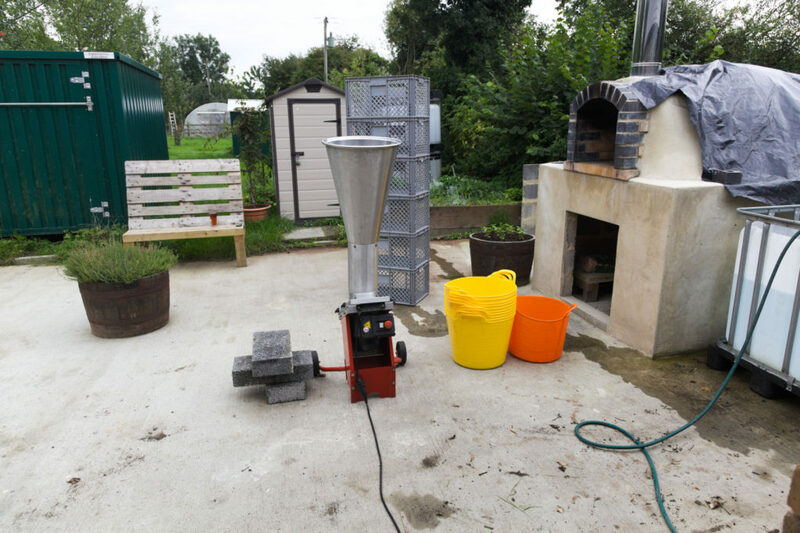 A good souce of fermentation vessels is the Home Brew Hop Shop which I have used for years. 1 Gallon glass Demijohns and 5 Gallon plastic wine fermenters are both excellent. Don’t forget the airlocks and rubber bungs! Ideally you should rack the cider twice during fermentation. Once when the fermentation slows down (rate of bubbles through the airlock reduces, SG < 1.015) and once after it has finished fermenting and the yeast has dropped to the bottom of the container. To do this you need one more container than the number needed to house the juice. All fermentation vessels should be full to the brim as leaving an airspace will most likely result in an infection after ferrentation has finished. How do I make it into cider? Very basically, you put the container of juice with the airlock filled with liquid in a cool place in the house / garage. In the initial fermentation the airlock may overflow with yeast. DO NOT put it on the carpet/expensive furniture! Check on it every week. Clean the airlock if it is full of yeast or gunk. Don’t forget to cover the container if you remove the airlock to clean it. While checking on the container observe the rate of bubbling. When the rate of bubbles through the airlock slows down – if you use a hydrometer the specific gravity falls below 1.015 – it is time to rack. You carefully transfer the cider from one vessel to another using a hose leaving the sediment behind. You put the airlock back on the second container and leave it to carry on fermenting. Once it has completely finished fermenting and has cleared you again rack it into a new container with a hose leaving the sediment behind. It is now drinkable if young and harsh. You can leave it to mature and become more rounded or bottle as required. I am happy to give advice as needed feel free to drop me an email if you have questions. I am also building a guide section on my website of cider making resources. There are many great books available on cider making. The new cider makers handbook by Claude Jolicoeur is brilliant and Craft Cider Making by Dr Andrew Lea is also excellent. There are also numerous online resources for budding cider makers. The cider workshop google group is very helpful. I am also building a guide section on my website of useful cider making information that may help. Could I get any fruit from you? Please get in touch via the contact form. I buy in fruit on top of what I harvest in Llanblethian Orchard. As such I should be able to purchase a little more so you can try your hand at cider making. Can you make the juice into cider for me? No sorry. During the season my barn is full to the gills with my own cider and as such I am unable to ferment anyone elses juice into cider. Also if I make anyone elses cider on the premises and im inspected it will fall into my duty allowance which I have none to spare. I don't have any containers can't I use yours? Unfortunately not. I use all my containers during the season. I start by filling all the small containers then when I have enough of a blend I rack it all into an IBC. Then I start the process all over again. If you do need to buy some containers this homebrew shop is awsome and I use them all the time. Can't I just randomly turn up unanounced and expect you to squish my fruit? Please don’t, I may or may not be at the barn as I could be out picking fruit and you will have wasted a journey.